How to make 4 people paprika spiced pork salads? 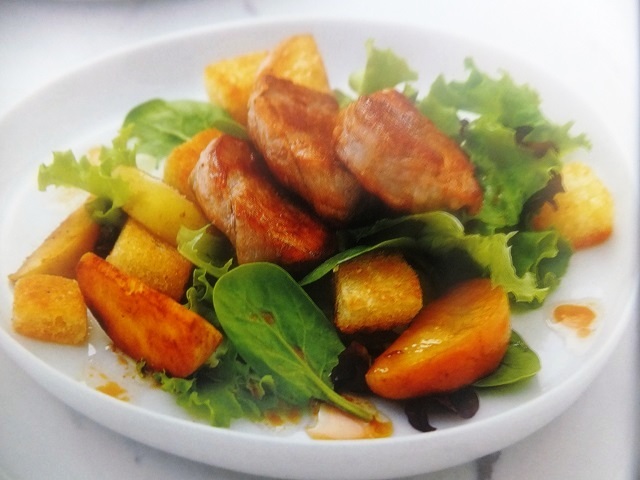 Paprika spiced pork salad recipes and ingredient shared on our page. Finelly grate the zest from 1 lemon and squeeze the juice. Put both into a bowl with the pork, garlic oregano, ground spices and yogurt, mix well, cover and set aside to marinate for at least 20 minutes (or up to 2 hours, if you have time). Preheat the grill to hot. Cut each of the remaining lemons into eight wedges. Thread four pieces of pork, two wedges of lemon, two bay leaves and two chillies, if using, alternately on each skewer. Arrange on a large foil lined grill tray and grill for 15 minutes, turning until the pork is cooked through and lightly charred. Meanwhile, preheat the oven to 180°C (fan 160°C), gas 4 and heat a large griddle pan until smoking. Brush the onions and tomatoes with the oil and season well. Chargrill the onions on the griddle for 5 minutes, turn them over and cook for a further 2 minutes. Transfer to a baking dish and keep hot in the oven while you cook the tomatoes. Add the tomatoes to the griddle pan and chargrill for 2-3 minutes, without turning. Pile the tomatoes onto serving plates with the onions and sprinkle with some balsamic vinegar and flat leaf parsley. Arrange the spiced pork skewers on top to serve. 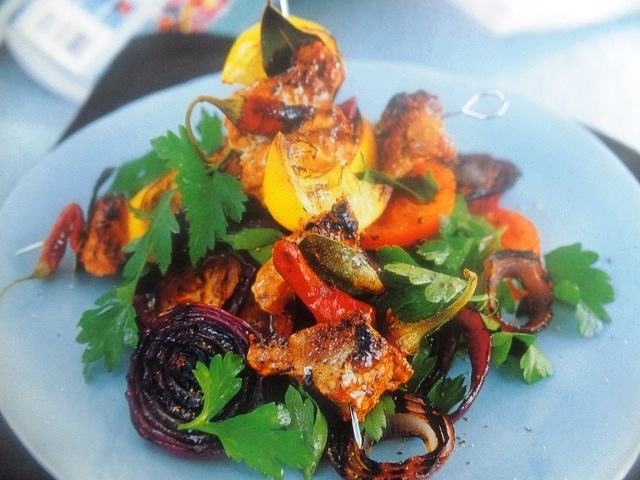 Now, your paprika spiced pork salad ready. Your enjoy meal!